Approximately 80 newspapers and a number of leaflets printed in Jerusalem during the Israeli Independence War. Jerusalem, April-November, 1948. • 63 issues of "Dvar Yerushalayim, Iton Poale Yerushalayim". July-November 1948. The issues contain news about the battles in the Jerusalem area. • Four issues of "Hayom" newspaper. April-July 1948. The issues include, among other things, reports about the destruction of "Hachurva" synagogue, battles in Ramat Rachel and more. • Three issues of "Iton Hamagen" newspaper, published by the publicity department of the Haganah. April-June 1948. • Two issues of "Yediot Yerushalayim", a joint newspaper of six national newspapers published in Jerusalem during the siege. April-May 1948. 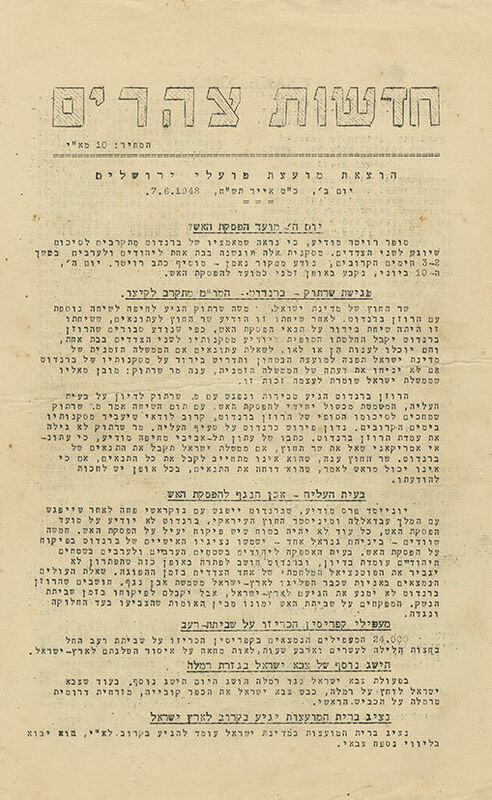 • Six issues of the paper "Chadshot Zohorayim" published by the Jerusalem Workers Council, typewritten and mimeographed. May-June 1948. • "Hayoman", issue from 3.6.1948. • Five leaflets with news and updates regarding Independence War battles: "Division 6, Diary of Jerusalem Division"; "Bulletin no. 145", 25.4.1948 – transcripts of radio updates broadcast by "Kol Hamagen HaIvri" radio station of the Haganah; "Eretz Israel BeShidurim Arviyim, 13-14.7.1948"; "Kol Yerushalayim"; and more. Size and condition vary. Good-fair overall condition. Some issues are missing leaves. Stains. Tears and open tears (mostly small, at margins), some reinforced with adhesive tape. A number of issues with ink-stamps and handwritten inscriptions.